Discover the animal kingdom as you've never seen it before! From the wings of the almighty albatross to the deadly facts of the great white shark, Knowledge Encyclopedia Animal! transports you into the jaw-dropping, heart-thumping, pulse-racing world of the animal kingdom. Exploring everything from habitats and ecosystems to senses and respiration, Knowledge Encyclopedia Animal! is easy to follow and full of fun facts for kids. Bursting with amazing 3D images, the animals are brought to life, from the tiniest of crustaceans to the mightiest of mammals, in a brand new, all-encompassing animal expedition. 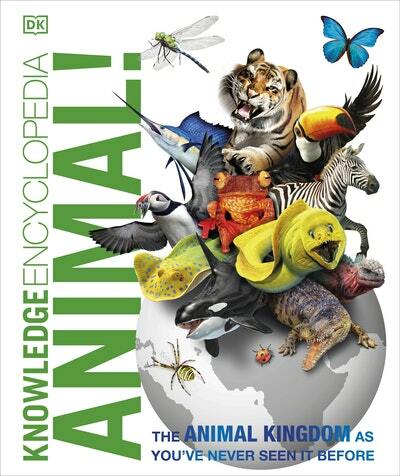 Knowledge Encyclopedia Animal! allows you to take a closer look at the ever-evolving world of your favourite animals and is perfect for children aged 9 and up. Get ready to bring the animal kingdom to rip-roaring life! Love Knowledge Encyclopedia: Animals!? Subscribe to Read More to find out about similar books.